FYI supplement provides the building blocks needed to support healthy cartilage and connective tissue. Its ingredients include mucopolysaccharides, a naturally occurring compound that helps build cartilage, as well as chondroitin sulfate for cartilage elasticity, pain relief and increased range of motion. FYI is carefully blended using our proprietary Poten-Zyme process and, as a result, is easy for your body to digest and absorb. If you're among the millions of Americans suffering the pain of inflammation, get relief starting today with FYI. How does FYI supplement work to reduce the effects of inflammation? What makes FYI better than other formulas? 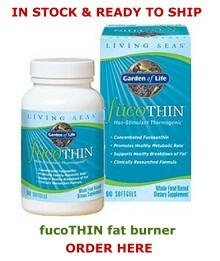 *Inhibits COX-2 enzymes that produce pain when stimulated by injury, stress, poor diet or other factors. *Supports joint integrity with collagen-stabilizing building blocks that promote joint lubrication to lessen friction. *Provides vital amino acids that assist in the production of collagen. *Reduces acidity that can lead to inflammation. *Supports the immune function, which can prevent the body from attacking its own tissues. *Enhances enzymatic activity to cleanse the blood of toxic proteins that exaerbate an overactive immune system. *Reduces oxidative stress by helping to destroy harmful free radicals. * Systemic enzyme blend, a combination of protein-digesting, therapeutic enzymes able to function in a wide range of pH environments and temperature conditions. *Bromelain, a powerful protein-digesting enzyme from pineapple that is helpful in reducing injury-related pain, swelling and tenderness. *Papain, a mixture of protein-digesting enzymes isolated from papaya. *Lipase, a potent fat-digesting enzyme. *Cellulase, an enzyme that breaks down plant fiber. *Wild oregano concentrate, with 31 known anti-inflammatories, 28 antioxidants and four COX-2 inhibitors. *Ginger extract, containing multiple constituents that inhibit COX-2. *Cat's claw extract, used by Peruvian Ashaninka Indians for a wide range of illnesses and inflammation. *Turmeric extract, an Indian spice with potent antioxidant qualities. *Rhododendron caucasicum extract, with antioxidant value and cardio-protective properties. *Laminaria and ulva extract, which contain large amounts of protein, vitamins, polysaccharides and glucuronic acid. 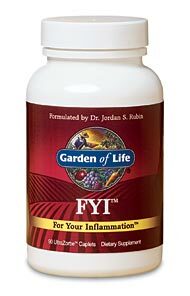 FYI is designed and clinically tested to offer the all-natural, time-honored support for inflammation without the costly side effects. It is uniquely effective due to the formula's bio-availability provided by the proprietary Potent-Zym process. Take 1 caplet 3 times per day on an empty stomach. For advanced use, take 4 caplets 3 times a day for 10 days, followed by 2 caplets 3 times a day for 80 days. Thereafter, return to 1 caplet 3 times a day. These statements have not been evaluated by the Food and Drug Administration. These products are not intended to diagnose, treat, cure, or prevent any disease.Copyright 2003 Garden of Life, Inc. All rights reserved.